The front cover has Aice5. The back cover has Takahashi Naozumi. 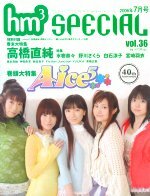 12 pages on Aice5 (Horie Yui, Takahashi Chiaki, Kimura Madoka, Kanda Akemi, Asano Masumi). 2 page Aice5 column by Kanda Akemi. 6 pages on Mizuki Nana. 4 pages on Nogawa Sakura. 4 pages on Shiraishi Ryouko. 1 page interview with Matsumoto Kana. 3 page interview with Miyazaki Ui. 2 page interview with Sakamoto Maaya. 2 page interview with Kanda Akemi. 3 page interview with Shintani Ryouko. 1 page interview with Shindou Kei. 2 page interview with Kobayashi Yumiko. 1 page School Rumble interview with Nabatame Hitomi. 1 page interview with Kuwatani Natsuko and Matsuki Miyu. 2 page event report on Kusuda Toshiyuki's 3rd solo live. 2 page interview with Kusunoki Taiten. 2 page interview with Takahashi Hiroki. 1 page interview with Kosugi Juurouta. 1 page interview with Kobayashi Yuu. 12 pages on Takahashi Naozumi.